A next-generation optical material based on perovskite nanoparticles can achieve vivid colors even on very large screens. Due to their high color purity and low cost advantages, it has also gained much interests in industry. A recent study including researchers with UNIST has introduced a simple technique to extract the three primary colors (red, blue, green) from this material. This breakthrough was led by Professor Jin Young Kim in the School of Energy and Chemical Engineering at UNIST. In the study, the research team introduced a simple technique that freely controls light emitting spectra by adjusting the anion halides in perovskite materials. The key is to adjust the anion halides by dissolving them in solvents to achieve red, blue and green lights. Application of this technique to LEDs can result in crystal-clear picture quality. Perovskite is a semiconductor material with a special structure containing metal and halogen elements. It is considered as a next-generation solar cell candidate because it has high photoelectric efficiency for converting sunlight into electricity. This material is also attracting attention as a light-emitting device because of its high luminous efficiency. Perovskite nanoparticles emit different colors depending on the internal halogen element. It emits red when it is rich in iodine, green when it is rich in bromine, and blue when it is rich in chlorine. However, perovskite is highly sensitive, making it difficult to change elements stably. Now, Professor Kim has developed a simple technique to replace certain elements via a solution process. The method involves inducing element substitution using nonpolar solvent and chemical additives. "In the study, we added a nonpolar solvent containing iodine (I), bromine (Br) and chlorine (Cl) to a solution of perovskite nanoparticles," says Yung Jin Yoon in the Combined M.S./Ph.D Program of Energy Engineering, the first author of the study. "Once the reaction takes place, the elements mixed within the nonpolar solvent switches its place with elements in original perovskite, which causes changes in luminescence. The added chemical additive serves to separate the halogen element present in the nonpolar solvent. As a result, the amount of halogen element in the solution increases, and over time, it is replaced with a halogen element in the conventional perovskite. The emission color is determined by the number of elements in the perovskite. The researchers also made LEDs with red, blue and green colors using perovskite nanoparticles produced with this technology. Kim Ki-Hwan, a research professor in the Department of Energy and Chemical Engineering, said, "It is stable compared to the existing technology to change the element in the solid perovskite. It could be applied variously to change the element composition in the perovskite material." "With our simple method, we obtained luminescence covering the entire visible spectrum from 400 to 700 nm," says Professor Kim. 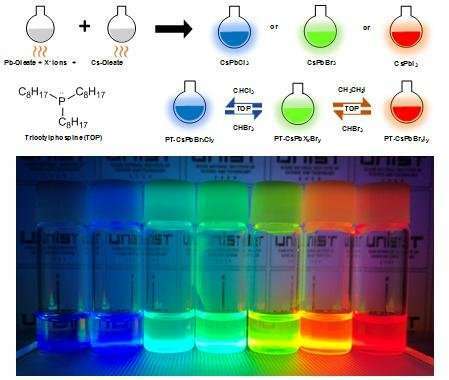 "Furthermore, saturated and vivid RGB LED devices were successfully fabricated using the anion-exchanged nanocrystals." More information: Yung Jin Yoon, et al., "Reversible, Full-Color Luminescence by Post-treatment of Perovskite Nanocrystals," Joule, (2018).